And, awards season has officially begun with the critically acclaimed television programs and films: the Golden Globes. Time for my red carpet fashion review. Lily Collins is perhaps one of my best dressed picks of the night in this absolutely stunning pink Zuhair Murad gown. Princessy and elegant. Tracee Ellis Ross looks glam in this Zuhair Murad sheer, sparkly dress. And the hair and accessories perfectly accent the dress. Star of my fave new show “This is Us,” Mandy Moore looks regal and elegant in this simplistic Naeem Khan navy gown with a flawless cape. 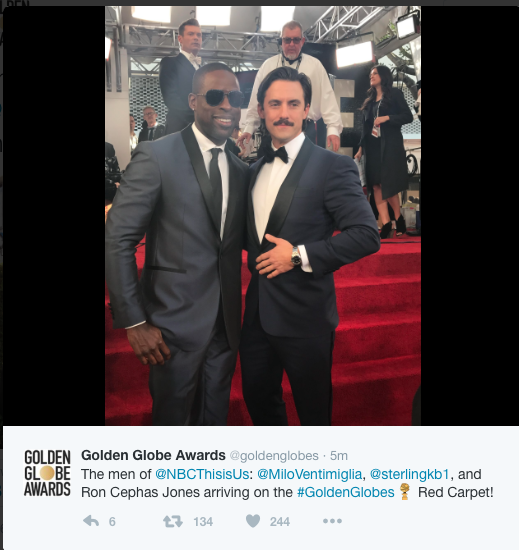 Mandy’s costars (her set husband and son), Milo Ventimiglia and Sterling K. Brown pose together. Awww. Ruth Negga wearing a perfectly tailored silver metallic Louis Vuitton pantsuit. Love. Edgy but still elegant. Kristen Bell, posed with husband Dax Shepard. One, cute celeb couple alert! Two, love her gown. So elegant and tailored to perfection. Little 12-year-old Millie Bobby Brown is already a fashion icon before she becomes a teenager! Flawless. Natalie Portman shows off her baby bump in a bejeweled Prada frock that I think she was inspired from her role as Jackie Kennedy. But she looks good, but perhaps another color? I love Sarah Paulson’s Marc Jacobs metallic gown. Gorge. Justin Timberlake and Jessica Biel are red carpet royalty! Love her Elie Saab gown, with the different textural elements that add interest yet still keep it elegant. Star of my latest Netflix obsession “The Crown,” Claire Foy looks positively regal. (Haha punny considering she was nominated for playing the Queen.) Very vintage-inspired. Some people may not like her lilac belt or the puffy sleeves– but I think it adds to the vintage elegance charm of the look. Carrie Underwood: Yikes. I don’t know what’s going on here between the chest ruffles, the sleeves, the crop top. Normally she always looks fab, ehhh not today. I do give her props for her beauty look– hair and makeup look very nice. I really like Busy Phillips’ Stella McCartney black embroidered gown. It’s very different from others on the carpet, but it works here. I’d maybe just do her hair a little cleaner? 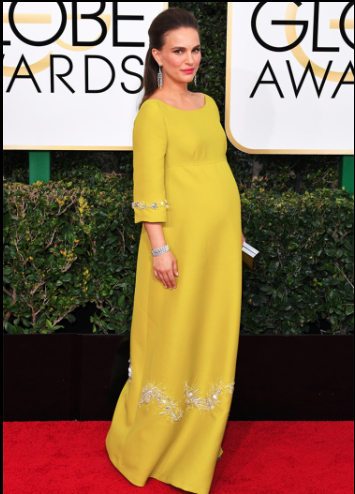 Drew Barrymore is giving me vintage vibes with her gown choice, and I like it. Chic and elegant. Love the sleeves and placement of the embellishments. Priyanka Chopra, star of my fave show, “Quantico,” wears an amazing custom Ralph Lauren golden gown. How appropriate given the venue. But it looks flawless. I’m a huge fan of Alessandro Michele’s work for Gucci, and Felicity Jones’ dress is no exception. Stunning. Love this little embellished bow detail. Michelle Williams is classic in a lace Louis Vuitton and I really like this look. So chic. And love her simplistic choker to accent the look. Rachel Bloom may be elated to be nominated again after her previous win OR that her great musical television show got picked up for another season on the CW. But, love her dress. So classic and gorge. Gal Gadot is the perfect example of baby bump chic. 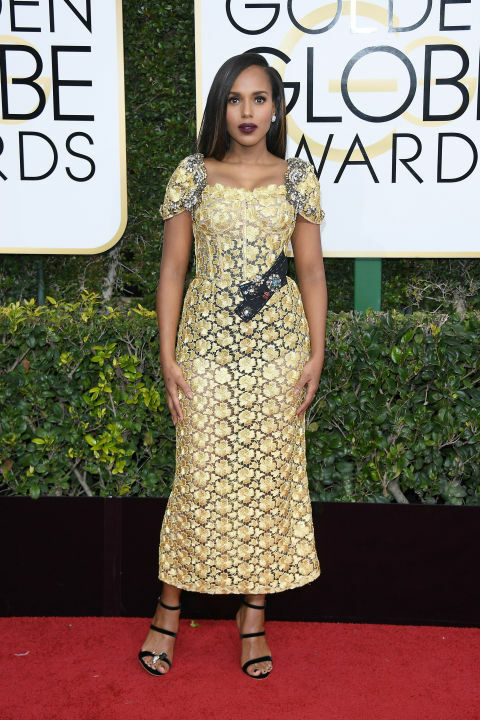 Kerry Washington goes for haute couture in this Dolce & Gabbana dress. Gorge. Love the shoulder detail! Love Brie Larson’s Rodarte red dress. So timeless and elegant with gorgeous beading detail. Best dressed list for sure. Zoe Saldana in an amazing Gucci dress. Love the ruffles and the bow. SO pretty. And so different from anyone else on the carpet. Anna Kendrick: Meh. It looks good, it’s just red carpet predictable. SJP looks so chic in her Vera Wang gown. I mean, she’s the ultimate fashion icon, and this is no exception. Love. 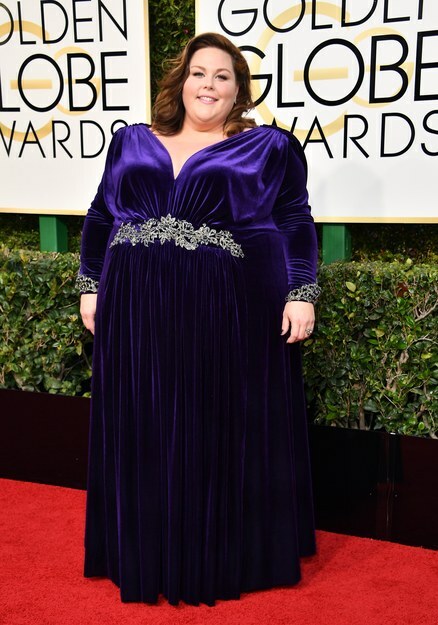 Chrissy Metz of my fave show “This is Us,” looks great. She’s positively radiant and the dress totally suits her. Congrats on the fantastic role, you are a true star. 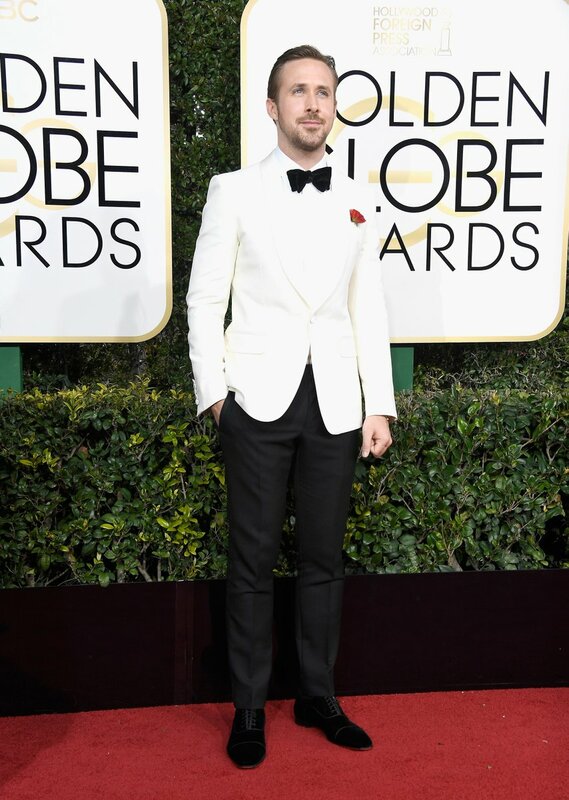 Ryan Gosling looks dapper in his white blazer. John Legend and Chrissy Teigen have a parents night out in their chic ensembles. Love her peplum gold dress. Gorge. But I cannot believe she actually SAT down on the red carpet for their interview with Ryan Seacreat– lol! Emma Stone stuns in Maison Valentino. Wow, so amazing. I love. Best dressed tie with Lily Collins?? So many gorgeous looks tonight! Let me know your thoughts. Onto the show! Love your review!! Definitely in love with Lily Collins look and Chrissy Teigen’s as well!